Last night I sat amidst a group of women, all who felt inadequate to be in this circle,discussing the journey of homeschooling our children. It is during these times that I am reminded of the great love that Father has for me to place me here, in this place with THESE women and THESE children on THIS journey! He is so good! The book that we were supposed to dissect was lay aside and we sat broken, needing encouragement. That was the moment that our monthly meeting turned into "Church" with one another! We spoke about laying down the rails with our children, training them in the habits that we desire them to leave our home with. Oh the convictions that washed over us all! One woman in particular spoke to my heart as she shared that we cant train our children in habits much less have a positive schooling experience without MUCH prayer and assistance from above! Oh Father how I have failed to include you so often in my homeschooling struggles! I hope that you also find yourselves amidst lovely travelers of which you can sharpen one another and be reminded of the things that you "know" but often forget like including the Great Teacher in your schooling! What a precious reminder of the need of the Body as well as the Head. God has been sweetly showing me when I have done what He requires of me with the children and to let Him continue on with them. And you're so right about this post. It's just so important to have good support through fellow travelers who will always lead us back to the Lord no matter what we're going through. mmm... wonderful post.... Oh, Father help us to keep our focus on you in all things. 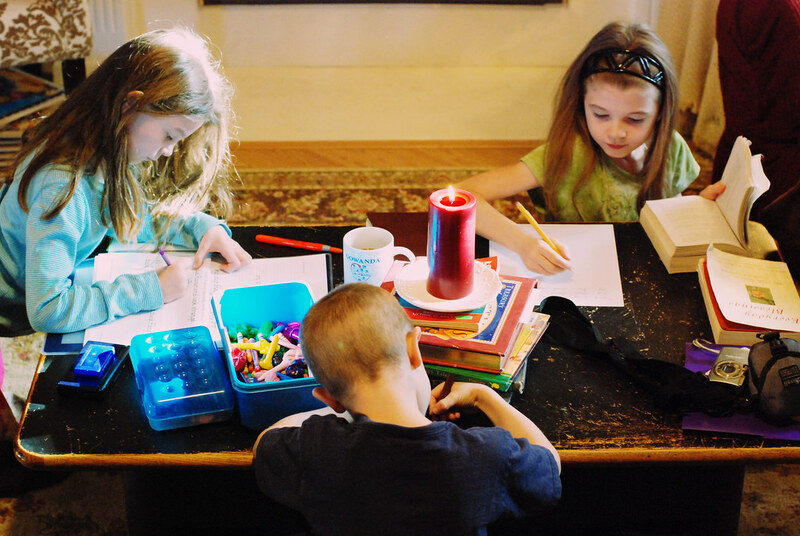 Good post- I love that picture of your kids working so peacefully.